SOUTH HOLLAND, IL – The Illinois State Historical Society recently presented their annual awards to groups or organization that have furthered the collection, preservation, and/or interpretation of an aspect of Illinois history. Judging was done by an Awards Committee appointed by the President of the Society and presentation of awards took place at the Illinois State Historical Society Annual Awards Luncheon in the old State Capitol building in Springfield. The College hosted a dedication ceremony for the new College History Wall and Display on Thursday, November 9, 2017 in the atrium of the College’s Main Campus. 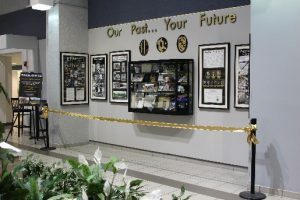 The display features photos and memorabilia from the college’s 90-year history. Many students, faculty, staff and administrators joined in honoring the institution that has made its place in the community and enriched the lives of so many. South Suburban College continues to grow with the changing cultural, technological and educational needs of the 21st century. Throughout our many years of service, thousands of people have received their education and gone on to improve their lives and their community. We at SSC are proud of our history of quality, convenience and affordability. 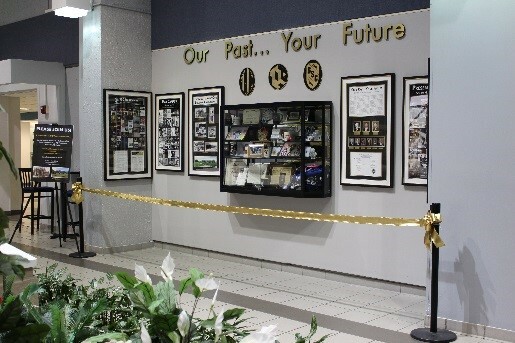 The wall and display are now permanent features of the college located at 15800 S. State St., South Holland, IL. The public is invited to stop by Monday through Friday to view the display.